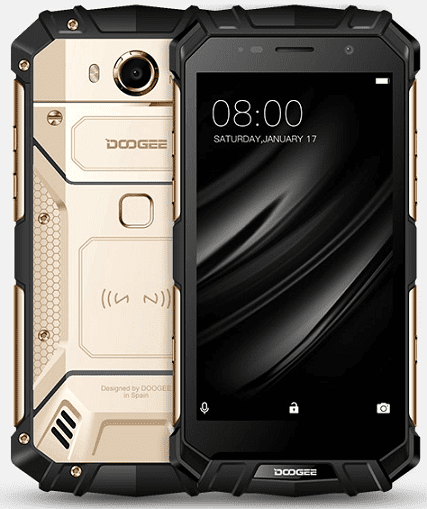 The Doogee S60 is certainly a device to give a look if you are in the market for a rugged device. It features the usual rubberised design that ensures it easily survives accidental drops. The use of aluminium alloy on the rear adds a bit more premium touch than most other offerings. The IP68 certified, water-resistant phone comes with a sharp 5.2-inch IPS display. This boasts Full HD resolution for a pixel density of approximately 424 ppi. Lying on top is tough Corning Gorilla Glass 5 to protect again scratches and cracks. It appears the Doogee S60 is ready to deliver awesome images with a robust 21MP Sony IMX230 sensor on the rear. This has an f/2.0 aperture, dual-LED flash, and phase detection autofocus. It also looks like you will be getting optical image stabilisation (OIS) feature in the package. Doogee S60 shoots high-res 4K videos at 30 frames per second. On the front is an impressive 8MP selfie shooter with a wide-angle lens offering almost 90-degree view. This records Full HD videos. Users can look forward to enjoyable performance with an octa-core MediaTek Helio P25 processor in the mix. This runs at speeds of up to 2.5 GHz! It gets support from generous 6GB DDR4 RAM and an ARM Mali-T880 MP2 GPU. Apps and games should run without glitches on the Doogee S60. Storage is also abundant at 64 GB – you will be able to extend this as well. For software, the Doogee S60 ships with Android 7.0 Nougat. Another impressive feature available on the Doogee S60 is the colossal 5580mAh Li-Polymer battery. So, you can expect a single charge to last a long time. The juicer supports fast charge tech. Wireless charging appears to be on the card as well. Dual-band Wi-Fi 802.11 a/b/g/n holds promise of very fast wireless connections. A fingerprint scanner is among the available sensors on the 4G device. Pre-order for the Doogee S60 has began in a couple of international retailers like Gearbest and Banggood. It is expected to start shipping late September. Doogee S60 is not officially available in Nigeria, but you buy the phone from a third party seller at Jumia. The price starts at $299.99 at Banggood. Doogee S60 Price in Nigeria is expected to range from 115,000 Naira to 190,000 Naira depending on your location in Nigeria.